Renata Coronado picks out a Play-Doh set on Saturday, Dec. 23 in Donna. 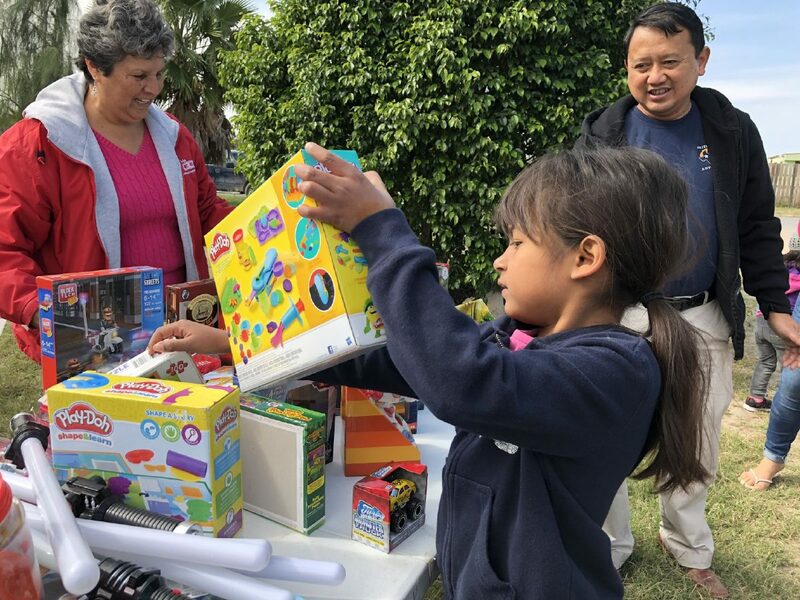 Parishioners at St. Joseph’s Catholic Church and Eka Yuantoro, the priest at the church, delivered toys to children in the La Frontera colonia. DONNA — Renata Coronado scoured the dozens of toys arranged on a table, meticulously looking for the perfect one. Meanwhile, three boys played with their new lightsabers in the back of Sandra Posadas’ home as she gathered merry children in her yard Saturday morning. In the spirit of Christmas, parishioners at St. Joseph’s Catholic Church and Eka Yuantoro, the priest at the church, delivered toys to children in the La Frontera colonia. Posadas, who has been entrusted to lead and organize community members in La Frontera, said a prayer expressing gratitude for the gifts donated by parishioners. Among them was Ron Daigle, a Winter Texan from Winnipeg, Canada who attends St. Joseph’s Catholic Church in Donna. “I’m just amazed at the Rio Grande Valley. The people are so friendly and so generous,” Daigle said. Donations, including Christmas gifts, have been pouring into St. Joseph’s Catholic Church on Salinas Boulevard in Donna. “There are children who were not able or cannot receive a gift during this season, but I feel happy because they were able to receive a little bit during this time,” Posadas said in Spanish. Some of those receiving gifts and clothing Saturday attend Catholic churches, but the volunteers and Yuantoro do not ask for religious affiliation. “That doesn’t matter because the church isn’t just for the Catholics, but the church is for all,” Yuantoro said. The kindness Daigle spoke of encompassed more than just the Christmas giving. Groups of volunteers along with Yuantoro make weekly trips to colonias, handing out food, clothing and necessities. They’ve gone as far as fixing a hole in the floor of a home to keep rats from entering. “How can they pray if we ask them to pray and they’re hungry,” Yuantoro said when asked about his motivation for mobilizing parishioners to give back. In working to achieve that, Yuantoro consistently makes personal visits to colonias to identify the needs of families. “It’s not just the institution, but the church for me, the concept of the church is the social movement with the people,” Yuantoro said. Daigle lauded Yuantoro for his constant willingness to contribute selflessly to others. “The prayers are nice, but (it’s) the actions, and he’s an action-oriented priest,” Daigle said describing Yuantoro. Once the toys were handed out, Yuantoro, Daigle and the other volunteers left the La Frontera colonia and headed to specific homes in other communities to deliver bags full of rice, beans and other food. Meanwhile, Posadas’s grandchild played with a stuffed bear he was given. “God is present in every moment,” Posadas said in Spanish.